We have seen our fair share of run/walk fundraisers this summer with still more to come right through the holidays. There are two types of themes when it comes to such campaigns: 1) outcome-driven, and 2) activity-driven. Outcome-driven campaigns focus on fundraising without any physical activity necessarily. If you want to raise money to support a cure for cancer, all your messaging on website, Facebook and other fundraising pages is geared towards giving participants a tangible image of what they help attain if they contribute. For an activity driven campaign, the messaging is focused around an engaging activity. You enroll people’s support by asking them to take part in an activity which can often be a difficult or exciting challenge — like dumping a bucket of ice on your head or running a marathon. The popular run/walk falls under this category. Unlike outcome-driven campaigns that don’t involve physical activity, people are more willing to get involved in activity-driven campaigns such as a 5k run. It seems people like the idea of working hard and undergoing pain on behalf of a cause. These tend to be fun and physically tough. They excite fundraisers and energize prospective donors to take up the challenge and give. 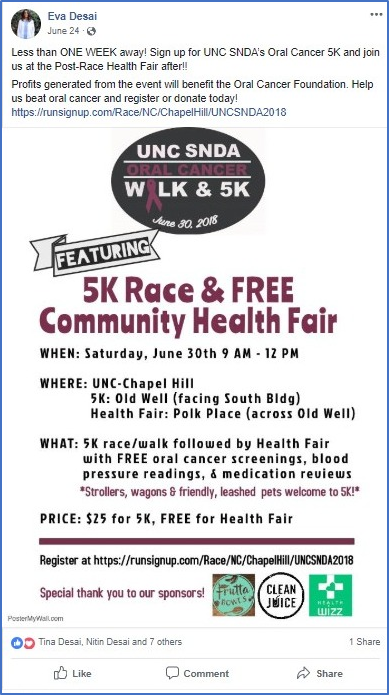 On behalf of UNC School of Dentistry’s Student National Dental Association, my friends and I hosted and organized the 2018 Oral Cancer Walk & 5K this past June 30th. Researchers have found that a fundraising challenge involving physical activity to advance a cause they care about consistently draws participants. Combined with active promotion of the event on social media channels and on campus, we were ready to maximize both participation in and contributions from this 5K event! Some of the material we used to promote the event on social media channels. From the support my fellow hosts and I received from our friends, colleagues and peers it is clear this event was a huge success. It surpassed our expectations in terms of participation and the funds we raised — from all the donations, race registrations, and help from our sponsors, we raised over $4,500, and after covering the costs of the race, we were able to donate over $1,800 to the Oral Cancer Foundation! Very thankful for the support and enthusiastic participation! Organizations have traditionally charged a flat fee to enter such events. We charged a flat fee of $25, and additionally encouraged participation by giving away prizes and T-Shirts. 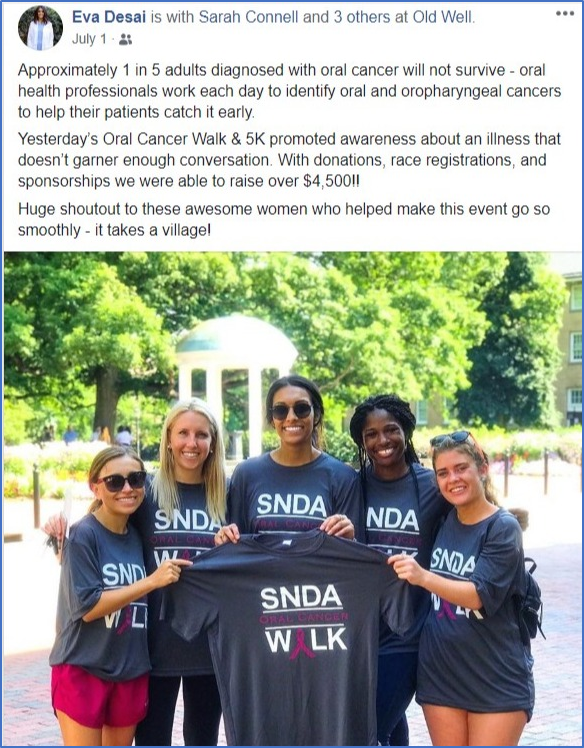 There was one other thing we did that was unique for the UNC SNDA 5K campaign to boost our participation and fund-raising success. One of our sponsors, Health Wizz, offered to give out $5 Starbucks Gift Card if the participants downloaded the Health Wizz App on their phones and confirmed they did the 5K through the app. Participants didn’t just get a physical $5 Starbucks Gift Card; they received rewards called “OmPoints” in their digital wallet through the Health Wizz App. It was actually a game! Participants could redeem their rewards points and get a code which they could use at Starbucks. No paper, no plastic, just a digital code to grab your favorite latte. Even though $5 is not a big amount, the fact that participants can redeem their rewards points for their favorite drink at the local Starbucks gets them pumped to brave a challenge. While exploring the Health Wizz App, we learned there were other fitness and nutrition related features built into the app, so users can participate in a variety of campaigns. Also, the participants of the UNC SNDA 5K campaign didn’t have to redeem their rewards points right away. They could keep accumulating OmPoints by participating in similar campaigns and redeem them later for a higher value like an Amazon Gift Card. It was a really neat concept! This could start people off on a path to better health by participating in other health related campaigns and earning rewards points just like we accumulate frequent flyer mileage on Airlines. Combining registration with interesting offers like a gift card will draw more participants and can maximize your fundraisers’ excitement and involvement in the event. It will also help participants offset part of the registration fee. On top of putting in some serious work, participants will be inclined to share about their participation not only at the Starbucks counter but also spread the word to their networks. So, leverage the ubiquity of smart phones and the affinity that people have for mobile health applications such as Health Wizz to take your fundraising potential to new heights!